I’m back from a lovely holiday in Gran Canaria, which brought temperatures of 28-30°C and glorious sunshine, which was very strong (UV 12). I’m missing it already. So, is there any summery weather returning to our region to lift spirits? 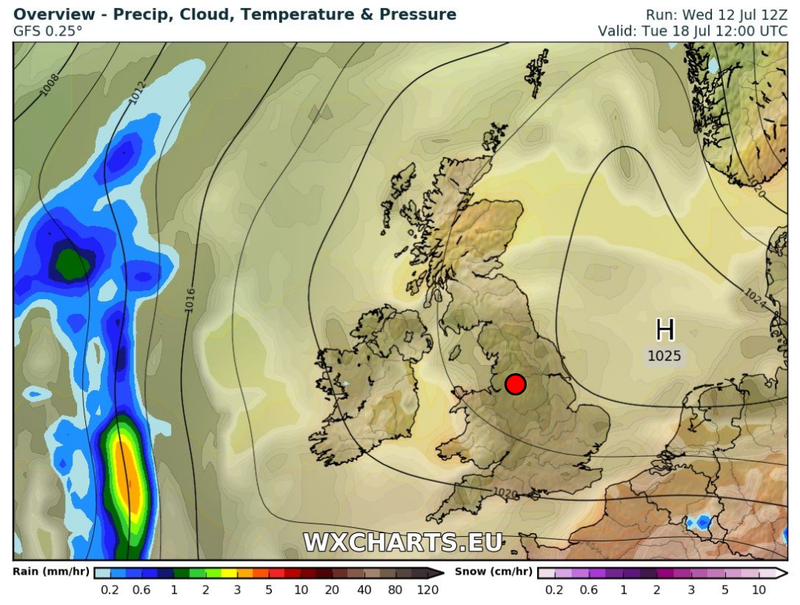 Looking ahead: Showery or longer spells of rain on the cards with temperatures remaining at similar values; 17-19°C, so definitely no sign of any settled, hot, summery weather returning. Follow @ChadWeather on Twitter for updates of your local weather. Keep up to date on Twitter, @ChadWeather, for the latest and the blog will return next week. Apologies the late blog today; too busy packing for Gran Canaria :). I personally think we’re having a decent summer so far and although this week started off wet (the rain was needed), it’s settled down again and there are some hints that even warmer weather could return next week. Outlook: High pressure could build in and bring warm settled conditions with sunny spells as we enter next week. If it remains and we drag in air from the continent then expect temperatures well into the 20s. After a wet, but at times very warm June, we have started July with mixed conditions. Looking ahead: Bright spells and a few spells of showery rain sneaking in from the northwest occasionally. Temperatures below average, hovering around the late-teens, so disappointing.